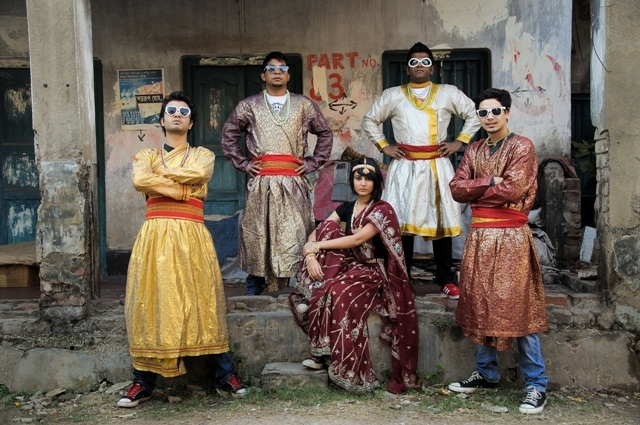 WHO If Ganesh Talkies took itsÂ name from a once-functionalÂ central Kolkata cinema hallÂ turned landmark, they haveÂ made it clear that it isnâ€™t justÂ about a quirky piece of christening,Â but goes right down toÂ the stress the five-member bandÂ places on the Bollywood soundÂ and sensibility. The two-yearoldÂ Kolkata band recently releasedÂ a four-track EP, ThreeÂ Tier, Non AC, independentlyÂ and has been featured in anotherÂ Indian indie music showpiece,Â Stupiditties 666. TheirÂ professed attachment to BollywoodÂ music is directly in conflictÂ with Indian indie musicâ€™s rebelÂ yell â€” and founding ethos â€”Â against the Bolly monopoly overÂ the music industry as well asÂ listener consciousness. SOUND They know what theyÂ are doing though. â€œNo matterÂ how much we say that we areÂ not into Bollywood music, everybodyÂ goes through an RDÂ Burman, Kishore Kumar andÂ Jatin Lalit phase at some pointÂ in their lives,â€ generalizes singer-Â songwriter Suyasha Sengupta,Â maybe somewhat contentiously.Â â€œWe thought of bringingÂ together our common love forÂ Bollywood.â€ This attestation ofÂ loyalty is repeated in multipleÂ online platforms the band usesÂ to push their stuff. On stage, GaneshÂ Talkies occasionally introducesÂ a certain Qawwali blingÂ to the proceedings â€” the musiciansÂ dressed in the kind ofÂ showy-shiny zari-excess regaliaÂ that is oh-so Mughal-e-Azam.Â â€œOur music isnâ€™t sarcasm, or evenÂ wry humour at the cost of Bollywood.Â It is fun but not essentiallyÂ funny,â€ mentions drummerÂ Arka Das. Take the track â€œTheÂ Fan,â€ based on the story of anÂ admirer who turns obsessiveÂ about a celebrity, has a slow-tomidÂ tempo conventional poprockÂ beginning and it seems theÂ entire band is struggling to remainÂ energized about their composition,Â before the song picksÂ up in the middle and SuyashaÂ Sengupta lets her vocals rise andÂ drop with ease. The song is interspersedÂ with a whiny line onÂ the keyboards, which, if one hasÂ to find a Bollywood connection,Â would come close to the snakecharmerâ€™sÂ been and the bellyÂ dance of Nagina-era movies.Â â€œRoadside Romeoâ€ falls moreÂ in the mawaali movies category:Â the brave single girl standingÂ up against a collars-up catcallingÂ generation of guys. TheÂ track creates and disrupts multipleÂ moods, going from an impishÂ opening phase held togetherÂ by whistles and a swinging keyboardsÂ run, a throbbing lockand-release act between theÂ drummer and bassist RoheetÂ Mukherjee. of those riveting hooksÂ from Nabarun Boseâ€™s keys whichÂ coalesces around a sing-alongÂ chorus and is undoubtedly theÂ most FM-friendly (like so muchÂ of Bollywood music), on StupidittiesÂ 666 that launched in SeptemberÂ 2012. The band went onÂ to win the Converse hunt forÂ The Original band, performingÂ in Mumbai for the first time inÂ December 2012. ON THE CARDS Working on theirÂ next set of songs for a fulllengthÂ album proposed for nextÂ year, Three Tier, Non AC bringsÂ the rousing hooks, rolls, groovesÂ and strings from multiple musicÂ styles to the lab. SPIN THIS â€œPyar Ka Tohfa,â€ aÂ track that is otherwise sung inÂ English except for a few lines inÂ Hindi, is the most tossed up fareÂ â€” reggae meet metal meet progressiveÂ and a guitar solo thatÂ could even be Bollywood-styledÂ disco on distortion [think MithundaÂ gone grunge in the closingÂ stages of â€œDisco Dancerâ€].